Cinema history is local history. 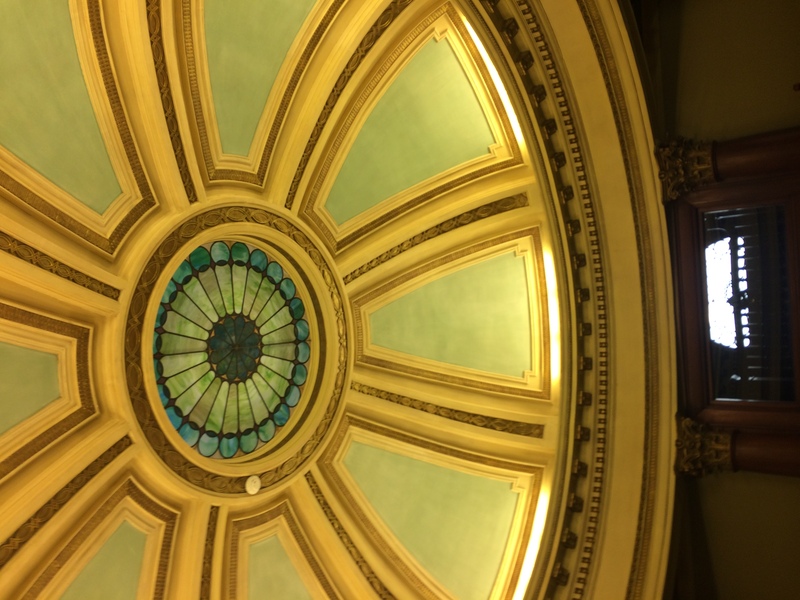 Films are produced and distributed across the globe (though not always) but the people showing them are often rooted in place, stewarding buildings of meaningful significance to the community (such as the many town halls or landmark theaters where movies have played). Audiences, too, tend to inhabit local real estate, rarely investing more than fifteen minutes of drive-time to see a movie. With this in mind, I have visited many towns and cities across New Hampshire to talk about local cinema history. This talk has grown more popular over the years, perhaps due to nostalgia for a cinema experience that is perceived to be on the verge of extinction, as well as because of a renewed commitment among some to restoring a sense of place and its resonant memories to their lives. If cinema history is local history, then the demise of cinema portends much more than just the loss of another small business as the lights go dark at the local theater. Many, it seems, are not yet willing to go gentle into that good night. 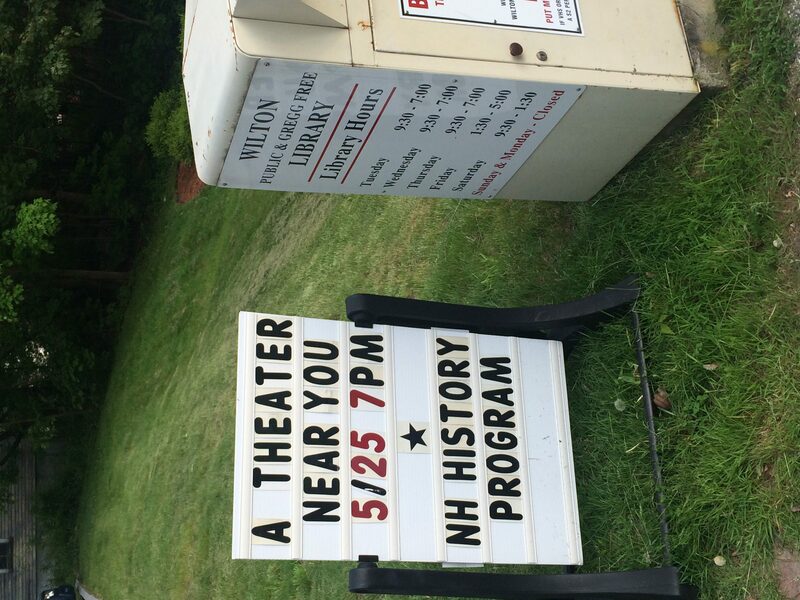 Recently, I had the pleasure of giving my UNH Speaker’s Bureau talk “A Theater Near You” at the Wilton Public and Gregg Free Library in Wilton, NH (read news coverage of the event here). 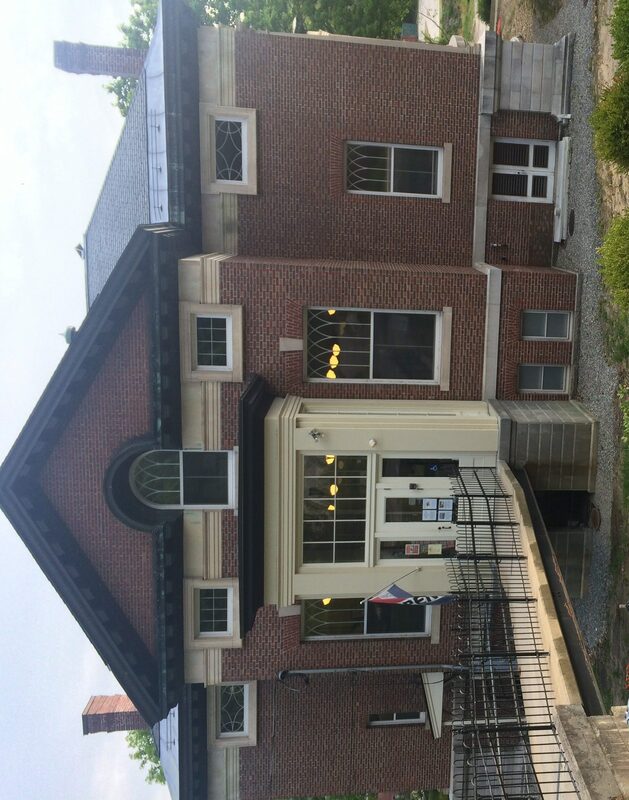 The library is a beautiful and historically significant building in a town that is also steeped in cinema history. 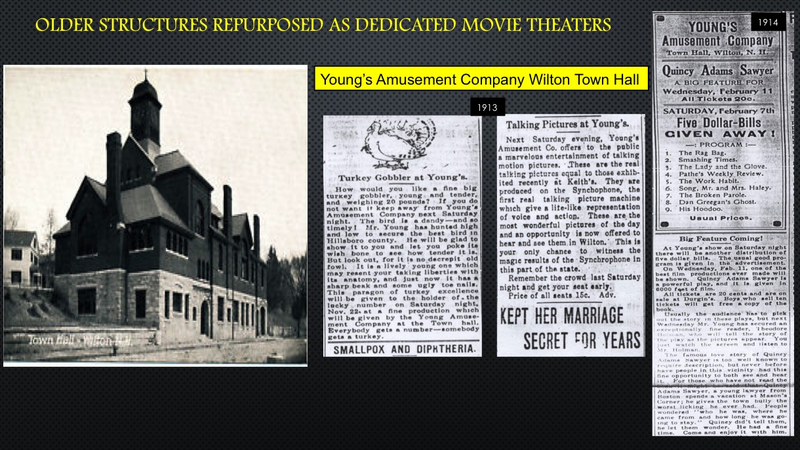 In 1912, Young’s Amusement Company began running movie shows in Wilton’s Town Hall, which had been constructed in 1883. Within a few years, they were building a loyal following as well as attracting newcomers through the innovative use of giveaways – live turkeys and “Five Dollar-Bills” (note the location of the hyphen, as opposed to Five-Dollar Bills!) – and special attractions like Synchophone talking pictures and Quincy Adams Sawyer, a “6,000” foot film (about six reels or sixty minutes) presented with film lecturer Theodore Holman in tow to “read” the film aloud for its audience. Today, after 104 years of nearly continuous operation, the Town Hall Theater continues this tradition of innovative programming and remains a vital hub of cultural exchange for Wilton and the Merrimack Valley, offering a mix of contemporary art and independent films, Hollywood classics, silent era movies with live musical accompaniment, and even the occasional Bollywood film festival. Not to mention some of the best popcorn to be found anywhere. 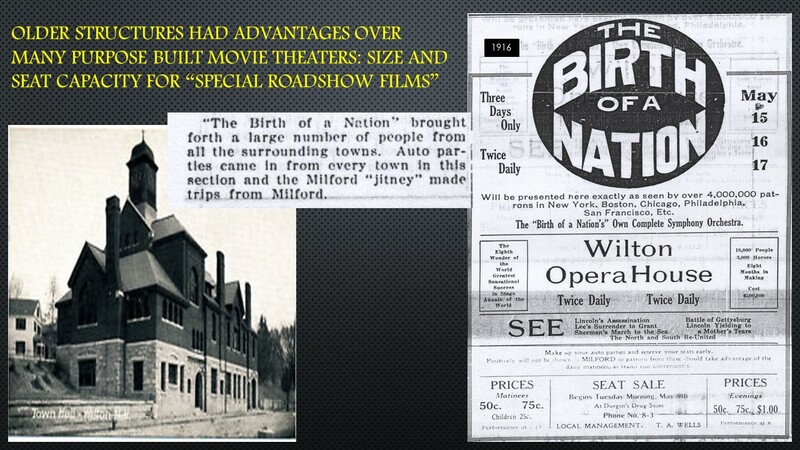 It is little known, but Wilton also had a second movie theater. 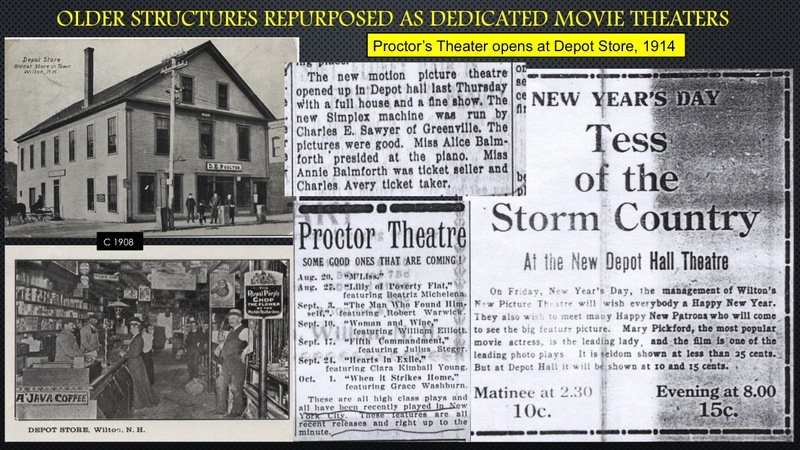 David Proctor began running moving picture shows at Depot Hall (situated one floor above his Depot General Store) in 1914, with the theater carrying on at least into the early 1920s. The newspaper noted that Proctor’s shows drew upon the skills of a projectionist – Charles E. Sawyer – from the nearby town of Greenville. Sawyer would go on to have a long career as a film exhibitor, managing shows at the Greenville Town Hall (“Sawyer’s Fairyland Theater”) and elsewhere into the 1930’s. Local sisters Alice and Annie Balmforth, here identified as pianist and ticket seller, would soon become the theater’s co-managers, joining the ranks of other pioneering New Hampshire women (such as May Burnham Richardson in Milford and Lottie Pierce in Manchester) who ran moving picture shows during the 1910’s and 1920’s. Click Map to Enlarge. Then Click HERE to Go Interactive! Residents in both towns (and others) were aware of the film’s highly controversial and unprecedented treatment of the Civil War and race relations during Reconstruction. The fact that residents in a town of nearly 4,000 people had to travel to a town less than half this size in order to see the film was an important cultural indicator during a time of widespread rural depopulation when social competition between small towns was intense. Indeed, every ten years, town newspapers across New Hampshire devoted days of coverage to rigorous and sometimes painful civic self-examinations prompted by population trends (for good or ill) as reported by the United States census. No town wanted to become, to borrow Hal Barron’s trenchant phrase, a place reserved only for “those who stayed behind” to be left in the wake of urban modernization. Instead, towns vied to remain vital destinations for new residents and tourists alike. Movies were a key part of this equation and movie theaters mattered not only because they offered routine amenities and escape from social reality but also for precisely the opposite reasons: they magnetized a place into a destination and produced a social reality. To argue that cinema history is local history isn’t to deny the importance of general aesthetic trends in cinema history, nor to discourage the attempt to develop a comprehensive narrative to explain the medium’s social, cultural and industrial history. Instead, it is an attempt to widen the scope of cinema history to include a broader range of people and places whose stories have much to teach us about the diverse and myriad ways in which movies as a new form of local culture both directed and responded to larger social and cultural changes in American life. In the 1910s and ’20s, these changes were profound, spanning crucial 20th century developments such as the political enfranchisement of women, the growth of competing transportation systems (trains, light rail and automobile), the cultural and economic redistribution of population across villages, towns and cities, and the creation and global expansion of the film industry and “Hollywood” itself. Dig where you stand; you never know what will turn up and where it will lead.